South Indian meal is the most comfort meal any time for me.My daily menu comprises of curry and dal(done in south Indian or North Indian way) to go with rice and roti,but my favorite rasam takes a back seat at my place and appears only once a week or once in two weeks.I feel any south Indian meal is incomplete with out rasam and I will not even complain if I am served only rasam with rice for my lunch. 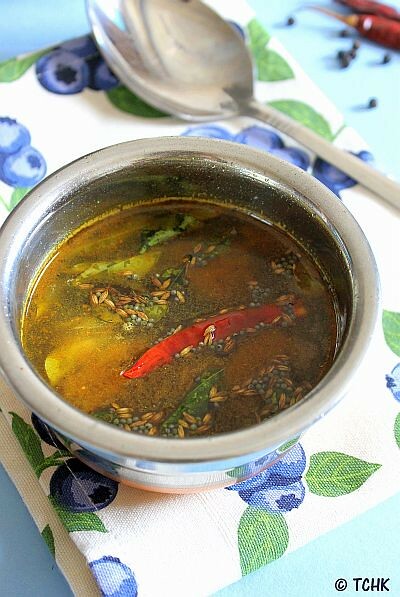 Pepper rasam is one of my favorite rasams as it is spicy and tangy with nice flavors.There are lot of versions for this rasam,while few use tomatoes or dal in this rasam,but my version requires just basic ingredients which are available in any house hold.Piping hot pepper rasam with rice makes a soothing and comforting meal especially when we have sore throat or cold.I generally make it in a big pot so that I can sip it as a soup when ever I want. Soak tamarind in water or microwave it with little water for 40 seconds and extract the pulp and keep it aside. Crush peppercorns into a coarse powder and also press the garlic pods slightly to release the flavor. Heat oil and add crushed pepper powder and also the crushed garlic pods and fry well. Add tamarind pulp to it and add enough water(approx 1 1/2 - 2 cups of water) to it. Add grated jaggery,turmeric powder,salt and rasam powder to it and let it come to a boil.Taste rasam at this point and balance with sweetness and salt required for rasam. Mean while in a small tadka pan heat ghee/oil and crackle mustard seeds and cumin seeds. Add curry leaves,broken red chilli and asafoetida and fry for half a minute. 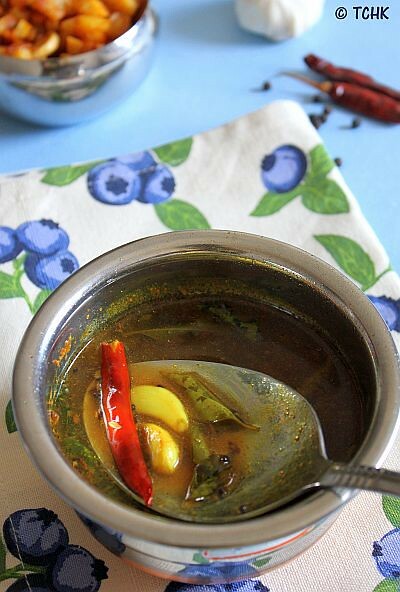 Add this tadka to the boiling rasam and boil for a minute and switch off the flame. 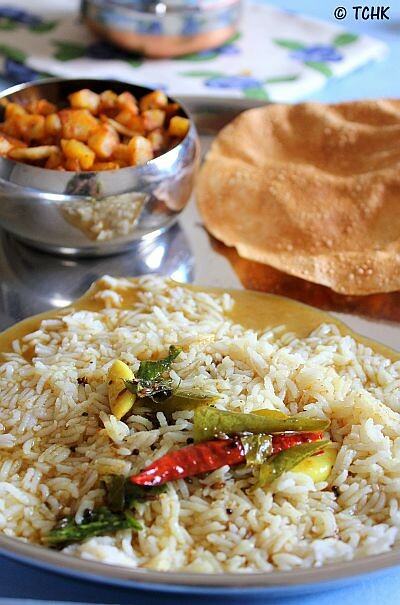 Serve it hot with hot plain rice with any fry as a side dish and papad. 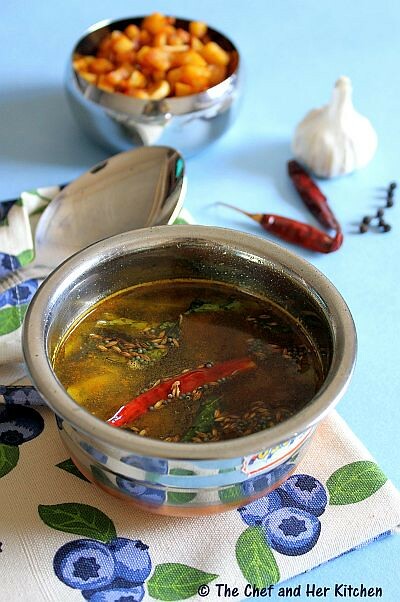 Addition of rasam powder is optional,I add it to make the rasam thick otherwise pepper rasam would be very watery. Increase the quantity of pepper corns to make it more spicy and also adjust jaggery and salt according to your taste. You can skip garlic pods in the recipe,but I highly recommend to use it. For a Vegan version use only oil and avoid ghee in the recipe. would love a bowl here! I love rasam. I can have it 24/7. 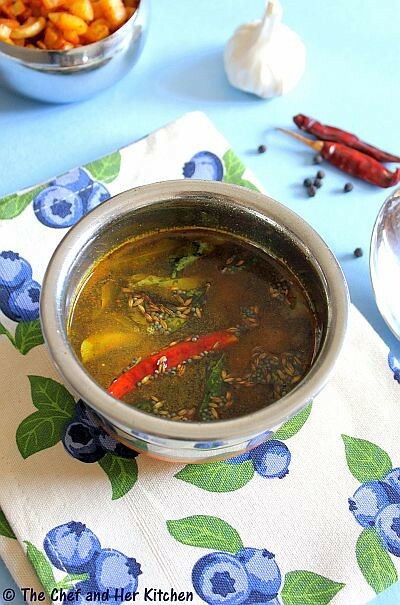 It is very tricky to photograph rasam because it has to make you feel the comfort from it. You have captured it very well. It brings the whole feeling into the rasam. simple and spicy rasam, liked ur version.. I feel to drink it all in one gulp..SO flavorful and awesome you presented it Prathy.Cheers! Yummm Perfect and comfort food nice one..
Nicely presented and looks so good! I love Rasam, and drink it. I finish my lunch and inner with rasam.. I love rasam , I love to drink , and i finish my lunch and dinner everyday. I prepare this healthy rassam offen at home..its toooo..Gooood.Love your site.